Available for $15.95 through West End Press or $15.08 on Amazon. War is defined as a state of open and armed conflict between two parties, but has typically been reserved to describe a declared and systematic campaign, such as one country warring on another or a country divided between two parties in a prolonged civil armed struggle. But what about the other, often unspoken of, and yet as systematic, wars? What about the war on women? The war on children? The war on ethnicity and heritage? The war on the mentally ill? And, the survivor’s war on self? is pathological. Keep this in mind when seeking help. worse than taking out a restraining order. strange city. Sometimes he’ll mistake it for a hunting license. A recovering addict and alcoholic, other poems drive home her survival against the juxtaposition of her brother and Aunt Pearl, neither of whom made it through this war on self. Family runs deep in this collection. Like many in The United States, Mish has a mixed, and often conflicting, heritage, of survivors, “the crackers and the/others—the music makers, the poets,/the artists, the medicine people.” She speaks of her ancestor Sterling Price, of Cherokee and Ulster Scot decent, stricken in poverty in the South, who “swore out an affidavit declaring/his ancestors were pure anglo-saxon” and “Those/brothers and their ilk who removed/their Indian in-laws. Who burned out/their Black neighbors’ homes”—the pain of her own mutiethnic mother, “spitting the [N] word” in her final days battling cancer. (“A Letter to My Cousin, Janna Little Ryan”) War, Mish tells us, takes place on ancestry. That the path forward is remembrance, is acknowledgment—is not laying these wars aside, but from discontinuing the current battles. What I Learned at the War contains many potential triggers for its readers and should be approached slowly and in a safe space where it can be given the time require to have its stories and Mish’s soldiery and survival properly honored. Poems from What I Learned at the War were previously showcased in The Wardrobe on the Sundress Publications blog. Read “For the American Dead” “#2 Proper Punctuation” “Honed” “That Summer…” & “Elegy for My First Boyfriend“. Jeanetta Calhoun Mish is a poet, writer and literary scholar with a PhD in American Studies from the University of Oklahoma. 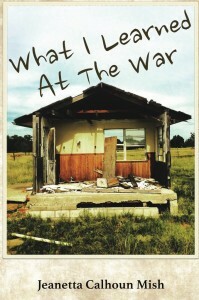 Mish’s most recent books are a poetry collection, What I Learned at the War (West End Press, 2016) and Oklahomeland: Essays (Lamar University Press, 2015). Her first poetry book, Tongue Tied Woman, won the Edda Poetry Chapbook Competition for Women in 2002. 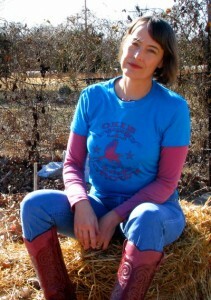 Her second poetry collection, Work Is Love Made Visible (West End Press, 2009), won the 2010 Oklahoma Book Award for Poetry, the 2010 Western Heritage Award for Poetry from the National Cowboy and Western Heritage Museum, and the 2010 WILLA Award for Poetry from Women Writing the West. Her poetry has recently appeared in The Fiddleback, This Land, Naugatuck River Review, Concho River Review, LABOR: Studies in Working Class History of the Americas, and more. Dr. Mish is the Director of The Red Earth Creative Writing MFA program at Oklahoma City University where she also serves as a faculty member in poetry and writing pedagogy. Raquel Thorne’s insightful essay regarding Mish’s work is powerful and triumphant. The sensitivity and generosity conveyed helps the reader better grasp Jeanetta Calhoun Mish’s achievement. Thanks so much for posting this amazing work.